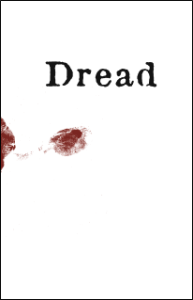 Dread is available as a soft-cover book and as a downloadable PDF. 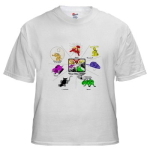 Contains game rules, three pre-written scenarios and character sheets/questionnaires. International Shipping Instructions: The button above will work for US, Canada, Mexico, Australia, and most European countries. Global Priority Mail is about US$10 to Canada and US$15 to most European countries. If you need it shipped elsewhere, or have any problems with PayPal checkout, contact us directly to arrange payment and shipping. The Dread paperback is also available at some local game stores and online through Indie Press Revolution, purveyors of fine RPGs. The Dread rule book in PDF form, completely redone for letter-size output and extensively bookmarked for ease of use. The margins should also work on A4 size paper. Tell the world how much you loved that Dread game you played at Gen Con. We have t-shirts and buttons for sale at our Impossible Dream Café Press store.